In January, I preached about spreading God’s glory from our neighbors to the nations. It is my conviction that Christ called us to be witnesses from our hometown to the ends of the earth (Acts 1:6-8). In fact, the entire layout of Acts is how the Spirit led His people to fulfill His mission. So, too, must we be led by the Spirit of God to seek out ways to strengthen God’s people and share God’s gospel through Jesus. —given this not only a name, but in what we should be engaged: reaching our people and our neighbors with the Gospel. The majority of our members only come to one service per week, either due to driving distance, work, health reasons, or just lost the habit of attending (Hebrews 10:25);. The majority of those who live in our neighborhoods come to zero services, thus are not being fed the Gospel nor are they fellowshipping with those who are under the Gospel of Christ. Three have already expressed interest in leading a REACH group: Alex Marshall, Jr. (Lexington), Cam Potts (Richmond) and Mike Hamilton (Winchester). Doug and Mindy Yates are working on leading a REACH group here at church on Wednesday nights to reach our parents/grandparents who drop off their children to TeamKID. We will also have a REACH group that will meet on Tuesday at 10:00 A.M. here in the Athens area. We will make use of three resources to train these leaders. 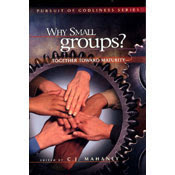 The first (and primary) is the Scriptures, along with “Why Small Groups?“, edited by C.J. Mahaney. The other will be “Sticky Church” by Nelson Searcy. ns based upon the Sunday morning sermon (I do this to keep from adding one more “thing,” and to help streamline our teaching ministries here). We will have sign-up sheets in the vestibule (that’s church language for ‘foyer outside the sanctuary’). Alex lives in the Hartland area in Lexington and Mike Hamilton lives in Winchester. If anyone else is interested in leading one, please let me know so we can begin training ASAP. Otherwise, sign up for a REACH group and watch God move among that fellowship. Again, there will be sign-up sheets in the foyer. Please sign up for one of these, or volunteer to lead a group. If one were to simply look at the world with secular eyes, a case could be made. In the name of religion, the Crusades occurred, slavery was tolerated in Great Britain and the United States (supposedly Christian nations) and even in the homes men misinterpreted the Bible to inflict a tyrannical rule over their wives, all the while claiming, “Woman, the Good Book says you’re gonna submit to me, so what I say goes, no matter what!” Some even used this logic to physically abuse their wives — again with what they deemed was a biblical warrant for such deviant behavior. In the spirit of John Lennon, now comes Elton John on the scene making headlines with a recent interview made the comment, “I think religion has always tried to turn hatred towards gay people. From my point of view, I would ban religion completely.” He promotes the view that religion lacks compassion. Apparently this mindset is quite en vogue, for Rosie O’Donnell on her newest gig, “The View,” noted that radical Christianity is as big a threat as radical Islam here in the United States. ” It should be noted as well that O’Donnell is a homosexual as well. But back to John. In the midst of this article, he makes a very salient point that penetrations all of us who worship Christ as the Prince of Peace. Organized religion doesn’t seem to work. It turns people into really hateful lemmings and it’s not really compassionate. The world is near escalating to World War Three and where are the leaders of each religion? Why aren’t they having a conclave? Why aren’t they coming together? I said this after 9/11 and people thought I was nuts. Instead of more violence why isn’t there a meeting of religious leaders?” he said. It must be said that having all the ‘religious leaders’ come together is a tall task, especially since so many hold to so many differing views on salvation, the nature of Christ, and other intricacies. So it is difficult, nay impossible, for all religions to come together in any spiritual enterprise (see 2 Corinthians 6:14-7:1). But what about the Christian leaders? What about the unity of those who hold to Christ and His Word? Are we becoming so spiritually minded that we forget Christ put us here as salt and light (Matthew 5:13-16) as a testimony to His good work on the cross and how those barriers of hostility may be broken down through Him (Ephesian 2:11-22)? What Elton John and Rosie O’Donnell and others of their ilk have a problem with is the Bible’s view of homosexuality — and that we cannot change because Scripture says what it says. We cannot nor should not re-write the rule books no matter how loudly people yell. Plus, they yell we are being too exclusive in our views — yet they are being as exclusive in their views as we are — even more so, saying that whoever disagrees with them is wrong and needs to be corrected. Yet they add that we are the equivalent of those who are terrorists. Now who is there to harm you if you are zealous for what is good? But even if you should suffer for righteousness’ sake, you will be blessed. Have no fear of them, nor be troubled,  but in your hearts regard Christ the Lord as holy, always being prepared to make a defense to anyone who asks you for a reason for the hope that is in you;  yet do it with gentleness and respect, having a good conscience, so that, when you are slandered, those who revile your good behavior in Christ may be put to shame. For it is better to suffer for doing good, if that should be God’s will, than for doing evil 1 Peter 3:13-17, ESV). They may not like what we say or teach, but when Christ’s love permeates our thoughts, words, and actions, they will see the truth of God’s Word in our lives and be shamed for not embracing the same truth as well. Even James tells us what true religions should be, and it looks good! If anyone thinks he is religious and does not bridle his tongue but deceives his heart, this person’s religion is worthless. Religion that is pure and undefiled before God and the Father is this: to visit orphans and widows in their affliction, and to keep oneself unstained from the world (James 1:26-27, ESV). Of course, the context of James’ passage comes from being ones who are not simply hearers of the Word, but doers as well (James 1:22). So again, we should be as followers of Christ ones who ban bad and embrace true Christianity. The world — even those antagonistic to the Scriptures — won’t help but take notice. Just when I thought the ESV machine couldn’t get any better, B.C. McWhite draws our attention to a way to download the ESV Bible via flash or mp3 for free!. This is simply astounding! 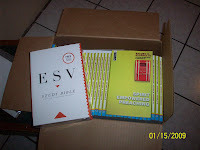 Plus, take a look at the Global Training Network distributing 150 ESV Study Bibles at the Uganda Conference 2009. Lastly, here’s a pic of an ESV Study Bible along with copies of Spirit-Empowered Preaching by Art Azurdia that we gave out to our pastors’ conference while I was in Trinidad. Did you notice that we have not mentioned Noah yet? Let’s fix that: Genesis 6:8 says, “But Noah found favor in the eyes of the Lord.” The word “favor” can also be translated “grace” as well. He is only one of two men in the Old Testament referred to in this manner—the other being Moses. He is the subject of Genesis from Genesis 6-9. But do we see the Good News that is the Gospel found here? Absolutely! God by His own initiative chose Noah who was “blameless in his generation [and] walked with God” (6:9). God informed Noah of His plans: “I have determined to make an end of all flesh. . . . I will destroy them with the earth” (Genesis 6:13). But God galvanized the heart of Noah. We realize from Genesis 9 that Noah was not perfect—but God’s grace shone on Noah’s heart and strengthened him to obey. Harry Ironside stated that salvation was like Noah inviting a pagan in his day to place his trust in God’s Word and come in to the ark. Some view salvation like Noah offering to put a peg on the outside of the ark. “If you just hang on through the storm, you’ll be saved.” Salvation is not dependent on our holding on to God, but on our being securely held by and in Christ. In the six hundredth year of Noah’s life, in the second month, on the seventeenth day of the month, on that day all the fountains of the great deep burst forth, and the windows of the heavens were opened. And rain fell upon the earth forty days and forty nights. On the very same day Noah and his sons, Shem and Ham and Japheth, and Noah’s wife and the three wives of his sons with them entered the ark,  they and every beast, according to its kind, and all the livestock according to their kinds, and every creeping thing that creeps on the earth, according to its kind, and every bird, according to its kind, every winged creature. They went into the ark with Noah, two and two of all flesh in which there was the breath of life. And those that entered, male and female of all flesh, went in as God had commanded him. And the Lord shut him in. So let’s review. God created all things. He made them good. He created humanity in His own image, and called them very good. They were to be fruitful and multiply, be caretakers of the earth, and enjoy God’s presence and provision. Yet, they rebelled when they listened to Satan tell them that they could trust his Word rather than God’s. They disobeyed and are under a curse that leaves them slipping and sliding and destined for hell and judgment, away from God’s presence and provision for all eternity. God saw the issues, and ordained not only judgment, but the man and the vessel to bring humanity’s deliverance solely by His grace. God even shut Noah in. Why? The lesson? Dear friends, God made you personally. He made you and wired you to bring and spread the glory of His name and the wonder of His fame to all peoples. Yet, out of a desire to honor self, you rebelled against Him. You wanted to rule your own life, live by your own agenda, and thus you turned your back on the living God. We are, as the Word says, destined to die and afterwards to face judgment. That is exactly what we deserve. Yet, God in His mercy did not leave us that way, but provided an instrument of salvation. An ark? Those pieces of wood point to other pieces of wood that came thousands of years later, put together as another instrument of our delivery—the cross of Christ. Noah points to Christ in that Christ found favor in the eyes of God not simply as a human being receiving God’s grace, but as the Son of Man and the Son of God who was God in the flesh, living righteously before His Father to stand as a substitute. Jesus is greater than Noah in that while Noah preached God’s Word of judgment to those who do not believe, Jesus preached and took our judgment in atoning for sins. He put Himself in the flood to absorb the catastrophe of that judgment we so undeniably deserve!! Given how great this deliverance is that our Savior and Lord provided for us, what will you do? Will you look deliverance right in the face, knowing that a much more horrific and eternal judgment awaits for those who reject our Savior in order to continue wallowing in hell-bent sin? Will you see the cross of Christ and the empty tomb as instruments of God’s mercy and grace toward you, in spite of the wrath from Him that you deserve? In John 6:44, Jesus says, “No one can come to me unless the Father who sent me draws him. And I will raise him up on the last day.” Is He drawing you this morning? So the Lord said, “I will blot out man whom I have created from the face of the land, man and animals and creeping things and birds of the heavens, for I am sorry that I have made them.”. . .  And God said to Noah, “I have determined to make an end of all flesh, for the earth is filled with violence through them. Behold, I will destroy them with the earth. Friends, we want you to be in this place to see that God holds you as highly valuable because you are the not product of some chemicals and peptides coming together to make you by chance. Psalm 139:14 says you were fearfully and wonderfully made even in your mother’s womb. You had a careful Creator and Designer. Blessed is the man who remains steadfast under trial, for when he has stood the test he will receive the crown of life, which God has promised to those who love him. Let no one say when he is tempted, “I am being tempted by God,” for God cannot be tempted with evil, and he himself tempts no one. But each person is tempted when he is lured and enticed by his own desire. Then desire when it has conceived gives birth to sin, and sin when it is fully grown brings forth death. It starts ever so subtly. It starts by just eating, drinking, marrying, and giving in marriage. Even if you believe if you call yourself (notice I said, “call yourself”) a Christian, but the extent of your life is eating, drinking, marrying, giving in marriage, driving, working, playing, school, charity work, paying your bills and taxes, even coming to church—but God is not active in the equation but is just an assumed player in your life, you are on a slippery slope. Let me take the danger one step further. You may be a well-meaning Christian. But you may approach Christian things in a selfish manner. Few things are tougher to see and overcome than selfish motives and ideas that are elevated to spiritual tests of faith. This is when churches become grid-locked in their own ideas of what they think God wants. When the gospel is not front and center and your eyes are not fixed on the crucified Christ. Rather, we have “sanctified” personal preferences, thinking that these line up with God. The danger is taking peripheral issues and putting them in the center, and putting Christ in the periphery. This is the essence of sin–even when we have the most noble of intentions in mind. Regardless of the intentions, we will be subject to God’s judgment due to our worship of those idols we have placed and staked right in the center of our will and, yes, our worship. That judgment is inevitable.